Madrid, 2 June 2017 – AECM, the leading European association of guarantee institutions celebrated its 25th anniversary in Madrid with a dense Annual Event and the Global Conference on Guarantee Institutions for SME Financing. The events were organized in collaboration with AECM’s Spanish member CESGAR, the World Bank Group and the SME Finance Forum. The event has received the High Patronage of His Majesty the King of Spain. More than 250 participants from over 40 countries took part in this event, which focused on June 1st around the association’s 25th anniversary and then opened on June 2nd to a global discussion on fundamental themes for guarantee institutions and their role in supporting the economy worldwide. On June 1st the former Chairmen took the stage to remember the moments that led to the creation of this association and the first steps. Founded in 1992 by 5 members, the German VDB, the French SOCAMA, 5 Confidi associations from Italy, the Spanish CESGAR and the Belgian CNCP, AECM’s first Chairman was Pablo Pombo from CESGAR / Spain. He, together with some his successors Thomas Garcia, José Fernando Figueiredo and our present Chairman Bernhard Sagmeister, recalled 25 years of activity on the side of SMEs in Europe. The afternoon continued with a series of “twinnings”, where the Chairmen of AECM’s working groups were paired with representatives from the European Commission, the European Investment Bank (EIB) and the Organisation for Economic Co-operation and Development (OECD) on themes related to their groups in a lively interchange, thus providing a comprehensive overview of the topics which are of interest to guarantee institutions. On June 2nd in the Global Conference for Guarantee Institutions three panels will discuss guarantees for Start-ups and Equity, the assessment of long-term sustainability of Credit Guarantee institutions, and finally how guarantees institutions tackle financing specific sectors, with a focus on agriculture. This will be complemented by several high-level speeches presenting the importance and added-value of the guarantee instrument as well as latest developments at supra-national level as to SME finance. 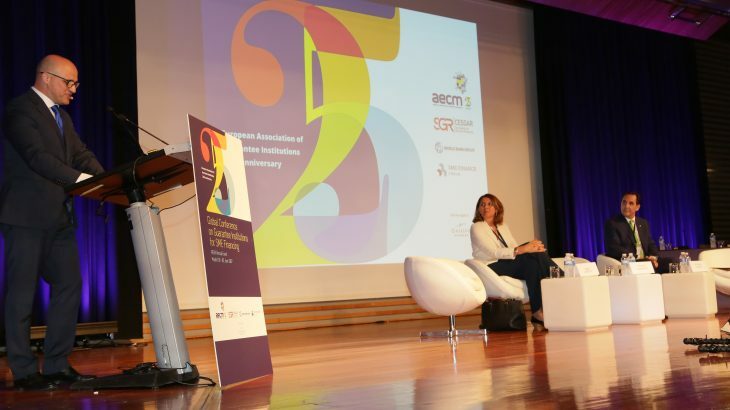 CESGAR emphasized the importance of hosting this annual event in Madrid, the place where the European association was born and highlights the need for AECM to be the intermediary of many business activities as a catalyst for the concerns and aspirations of millions of SMEs. The President of CESGAR, José Rolando Álvarez, has placed poor knowledge as the main challenge facing the sector across Europe and has therefore valued the unity of a sector that, in Spain, responds to 122,000 SMEs and contributes to the support of about 600,000 employees. In addition, a meeting of the Global Network of Guarantee Institutions (GNGI), an international network open to European and non-European guarantee organizations, took place on June 1st. The GNGI was founded last year during AECM’s annual events in Porto, Portugal, by a number of organizations from all over the world, including AECM. The network serves as a platform for the exchange of information on the industry in order to facilitate working together and making the guarantee business even more efficient. The network will meet every year at one of its member’s annual events such as ACSIC / Asia, AECM / Europe, REGAR / Latin-America or MENA, the Middle East and North Africa region and a Global Coordinator will be in charge of maintenance and representation. The coordinator is currently AECM’s Special Honorary Chairman José Fernando Figueiredo, CEO of the Portuguese Promotional Institution (IFD). AECM has 42 member organizations operating in 26 EU countries, as well as Bosnia and Herzegovina, Serbia, Russia and Turkey. Its members are mutual, private sector guarantee schemes as well as public institutions, which are either guarantee funds or or national promotional institutions. They all have in common the mission of providing loan guarantees for SMEs who have an economically sound project but cannot provide sufficient bankable collateral. At the end of 2016, AECM member organizations had a total guarantee volume in portfolio of over 85 bn. EUR and issued a total volume of over 29 bn. EUR of new guarantees for 3.1 m SMEs. More information is available on the AECM web-site at: www.aecm.eu. CESGAR is the Association of financial entities that provide guarantees to facilitate the access to finance of small and medium-sized companies and self-employed workers. CESGAR is a national umbrella organisation of 19 Mutual Guarantee Societies, the first of which had been created in 1979. The usually guarantee covers 100% of the bank loan. CESGAR plays a central role in the activity of Mutual Guarantee Societies by being their central negotiator with the Government, with the Central Bank and with competition authorities. The system of Public support is based on certain limited tax exemptions and mainly on counter-guarantees granted by CERSA at a rate (30 to 75%) that depends on political priorities such as innovation and types of operations such as investments. The World Bank Group is one of the world’s largest sources of funding and knowledge for developing countries. It comprises five closely associated institutions: the International Bank for Reconstruction and Development (IBRD) and the International Development Association (IDA), which together form the World Bank; the International Finance Corporation (IFC); the Multilateral Investment Guarantee Agency (MIGA); and the International Centre for Settlement of Investment Disputes (ICSID). Each institution plays a distinct role in the mission to fight poverty and improve living standards for people in the developing world. For more information, please visit www.worldbank.org, www.miga.org, and www.ifc.org .